As known as "Old Jeff"
Jefferson Market Courthouse was the center of one of New York City’s first grassroots preservation campaigns and an early example of a successful adaptive reuse project. People: Giorgio Cavaglieri, Margot Gayle, Carmine De Sapio, MacNeil Mitchell, Calvert Vaux, Frederick Withers, Robert F. Wagner, Jr. 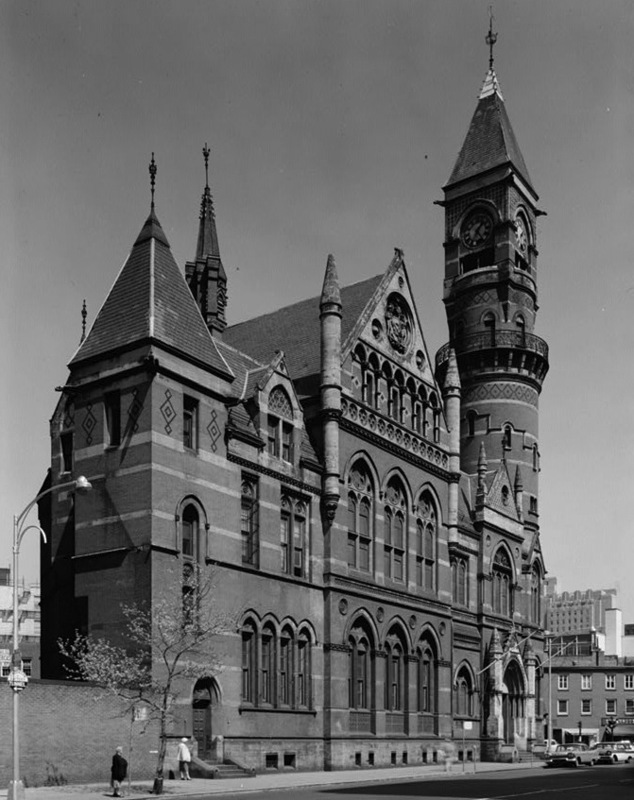 The Jefferson Market Courthouse is currently a branch of the New York Public Library system. It is located in Greenwich Village on Sixth Avenue between 8th and 10th Streets. On 8th Street there is a community garden where the former Women's Detention Center was located. By 1950, the Jefferson Market Courthouse had been vacant for five years, and faced demolition. The building's doors were closed in 1958. Pending demolition, the courthouse's neighboring Greenwich Village residents rallied to its defense.3 As part of the strategy to save the courthouse, the Villagers first sought to restore the clock atop of the building. Preservation activists, such as Margot Gayle, spearheaded the formation of the Committee of Neighbors to Get the Clock on Jefferson Market Courthouse Started. She launched a grassroots campaign to raise money to fix the clock. Villagers themselves, as well as several others who contributed, raised the required funds to restore the clock. By October 16, 1960, the community had raised enough money to fix the clock, and it began ticking again. For more information regarding Margot Gayle's involvement in the campaign to save the Jefferson Market Courthouse Clock see: Charles Hosmer, Interview with Margot Gayle. Under the auspices of the Eastern National Park and Monument Association. 23 June 1982. University of Maryland Libraries Collection. Norval White and Elliot Willensky, A.I.A. Guide to New York City (New York: The MacMillan Company, 1968). Village Neighborhood Committee for the Clock on the Jefferson Market Courthouse, bulletin, January 1965. Village Opens Fight for ‘Old Jeff,'” New York Herald Tribune, 11 June 1961; Anthony C. Wood, Preserving New York: Winning the Right to Protect A City’s Landmarks (New York: Routledge, 2007), page 281. Douglas Martin, “Giorgio Cavaglieri, Urban Preservationist, Dies at 95,” The New York Times, 18 May 2007.